The Maritsa Newspaper informs its readers that the new 10th International Folklore Festival opens in Plovdiv today. The Festival Parade of 10 groups from Greece, Egypt, India, Italy, Columbia, Mexico, Serbia and Montenegro, Ukraine, Hungary and Bulgaria (represented by the Plovdiv Ensemble ?Hebar?) will start at 5.30 p.m. from the building of Dom Levski, will go down all of the Main Street until the Stefan Stambolov Square outside the City Council. 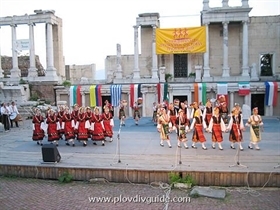 The official opening of the festival is tonight, at 8 p.m., at the scene of the Plovdiv Ancient Theatre in the Old Town.